The book on influencer marketing doesn’t exist. The space is littered with advertisers scrambling to generate results with influencers that aren’t natural endorsers. Given influencer marketing’s frenzied growth, this disconnect is understandable. I’ve spent a lot of time in this space over the last few years and have ironed out strategies that set the table for influencers to drive successful integrations and build lasting relationships with brands. Done the right way, influencer marketing can generate serious ROI for advertisers, substantial and sustainable income for influencers, and deep engagement with brands and influencers that audiences care about. How can influencers make it happen? Authenticity is crucial, and influencers can establish it by telling personalized stories about the product. Introducing relevant products builds trust with the audience. Over time, they’ll develop the habit of engaging with the brands because they’re consistently relevant to them. Advertisers will get great results working with influencers with that level of engagement, and will look to extend those relationships long-term. The audience is listening, and they want to know why they should use the product introduced. Get to the core of the product’s value proposition and make sure the audience knows what it’s all about within 30 seconds or risk losing their attention. Strive for native integration and personalized promotions. Something as simple as a co-branded landing page signals a deep level of integration and reinforces the connection between the brand and the influencer. Walk the audience through the experience and visually drive home all of its benefits. Really highlight the best aspects of the product. Make an offer that capitalizes on the strengths and interests of the audience. Do they go crazy for free things? Offer a free trial. Do they love competing with each other or the influencer? Host a private event. Do they want experiential prizes? Give them a chance to win a trip to a relevant event just for signing up. Digital brands are data-driven and careful with their budgets. It’s common for them to run small trial campaigns and push for performance compensation models like cost per action (CPA) or revenue share. If an influencer loves a product, they should be flexible to prove their value to the advertiser before locking in to a long-term deal. Be flexible at first, and learn from a trial window and establish a track record if the brand has cold feet. 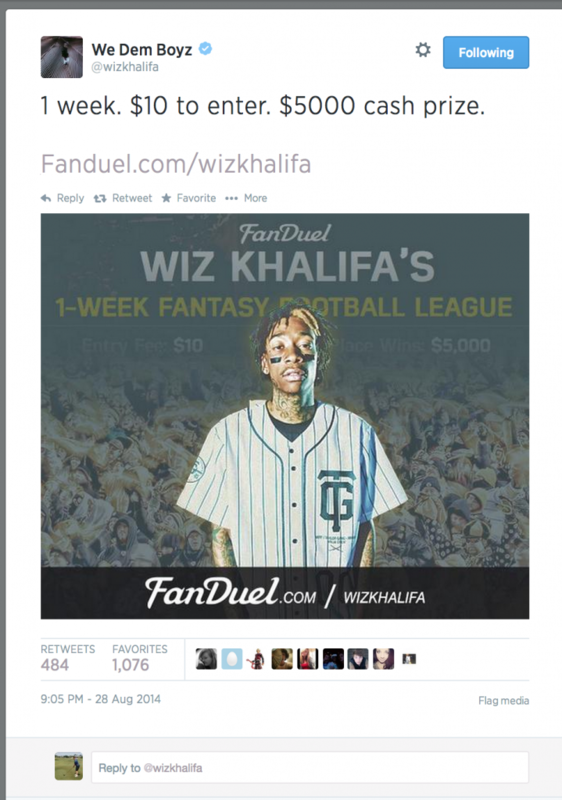 When Wiz Khalifa posts on social media, he’s straight to the point. Why break from that for his endorsements? We didn’t. And despite the lack of information, this post worked very well. 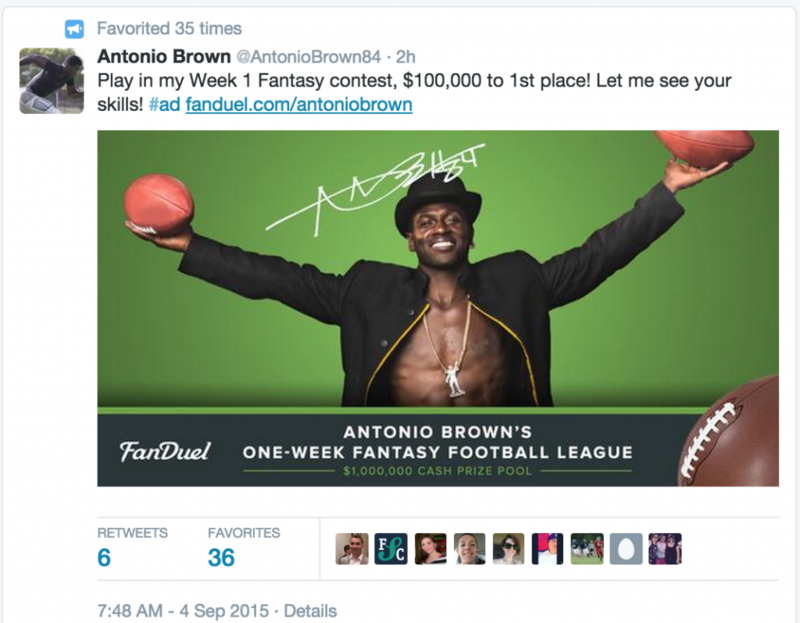 Chris Paul promoting fantasy football? Why not. Especially when he’s got a great picture playing quarterback in street clothes. Antonio Brown’s on fire as the league’s best receiver. He’s a bold personality so we used a bold picture from a bold photoshoot. 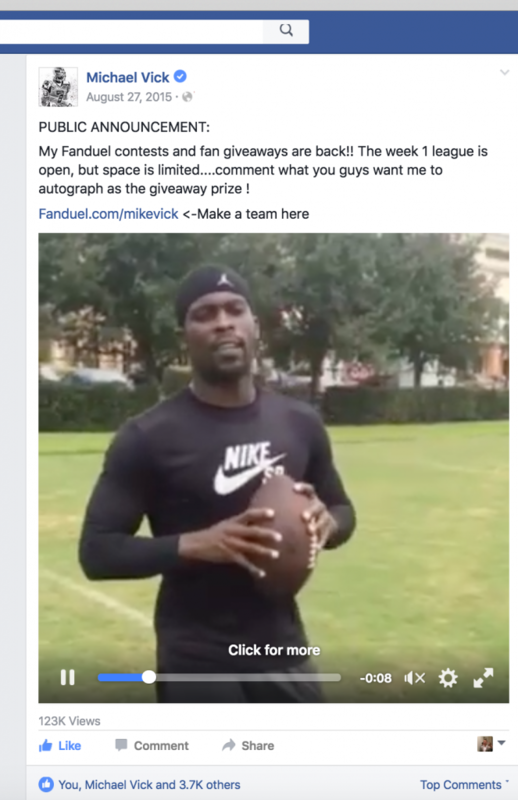 Michael Vick personalized his ad with a short video calling out his fans to play in his league and topped it off with a laser pass down the field. 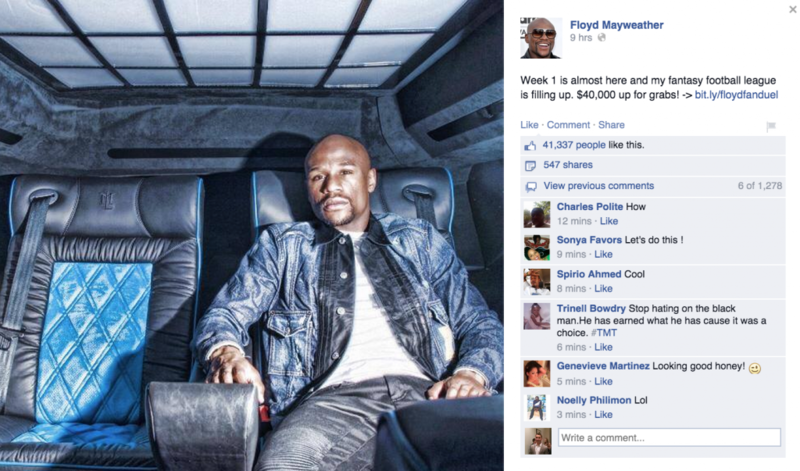 Floyd Mayweather has a lot of expensive toys and his fans (and haters) gawk over them constantly. In our ads with him we went with more of the same, using aspirational imagery with the allure of big cash prizes. Killer combo. Want to talk to Frank? Add him on LinkedIn.